Archein Elite is a rare Endurance creature card. It is part of the Core Set. In addition to the card's availability in the Core Set, two copies are included in the Black Marsh Smugglers theme deck, and one copy in the Telvanni Ambition theme deck. "You swim in deep waters." "I will have your moisture!" This card was previously part of the training mechanic where it could be upgraded from Archein Guerrilla at level 8. 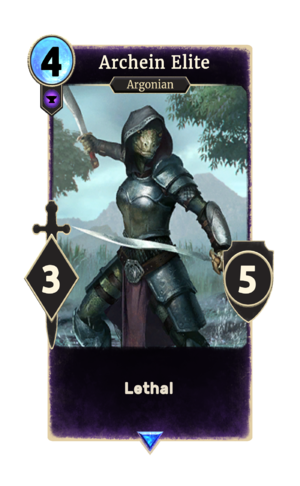 The card is named for the Archein, a tribe of Argonians who allied with Dunmer slavemasters. This page was last modified on 16 February 2019, at 13:37.